Since spring is finally here, the time to tend to the garden has arrived as well. This is the perfect time for you to get your children interested in gardening and convince them to spend more time outside. What you have to keep in mind is that children can become easily bored with something if that something is not entertaining and interesting enough. Which means doing whatever you’re used to doing in the garden won’t be enough to persuade your little ones to become more involved. You have to come up with ways to keep gardening interesting. This is precisely what we want to help you with today. Here are 8 ideas for you to try out! Children are going to be more interested in spending time in the garden if they get to see butterflies, birds, or ladybugs there. These creatures aren’t only going to make things more entertaining for your kids, but also help you tend to the garden. That’s because they’re what we call beneficial wildlife. They keep pests away from your plants and also help with flower pollination, so you should strive to have them around. The first thing you could do to encourage wildlife is to grow plants that naturally attract such creatures. For instance, if you want to attract butterflies, we recommend you plant lavender, red valerian, ivy, or golden rod. The second thing we suggest is making sure your garden is wildlife-friendly. This means creating nest boxes, bird feeders, and insect hotels. Doesn’t this sound cool? Your kids will probably be delighted to help you build them. They can also make sure the bird feeders are constantly full. Children are extremely visual creatures, which means they’re more likely to keep their interest if you stimulate them visually. In this respect, you have plenty of cool options. Perhaps one of the most awesome ones is providing your child with a camera (it doesn’t have to be an expensive one) and encourage him or her to take pictures of plants and animals in the garden. That way, the child can explore the garden and become accustomed to it, as well as learn more about different types of plants. Not to mention the fact that they may become interested in photography at the same time. Another option would be to encourage them to draw things they observe in the garden. For instance, they can do that outside in the sun while you work on tending to the land and provide them with interesting information on how to take care of plants in the garden. One of the most important things you should know about how to keep gardening interesting for children is that kids like to know they’re in charge of their own projects. Sure, you can ask them to help you with yours, and we’re going to get to that in a minute. However, they also have to learn how to be responsible for their own plants. In order to make this more interesting, we have a couple of suggestions. One idea would be to provide them with their own growing patch. There, they can choose what they want to plant. Even though you’ll be supervising them at all times, they have to be able to make their own decisions. Moreover, they’ll have to learn from their mistakes. 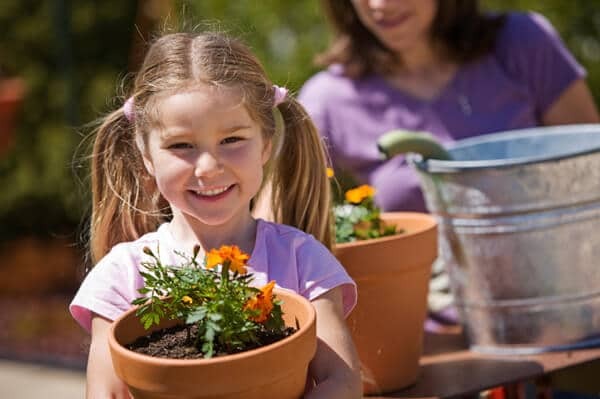 Some of the best things for children to plant are colorful flowers, so you can offer that suggestion. Another idea would be to encourage kids to grow a grass head using whatever materials you see fit, from an eggshell to potatoes. 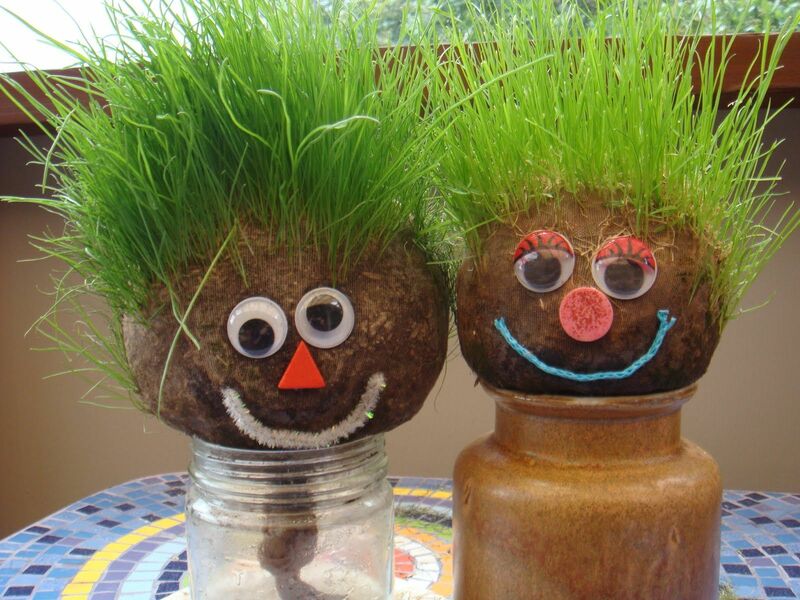 The fun thing about this idea is that the children will be able to decorate the grass head as they wish. All the while, they’ll learn how plants grow by following the progression of the “hair”. Children are more likely to want to spend more time in the garden if they have a play area where they can have some fun every once in a while. What you include in the play area depends entirely on you and the space you have available in your garden. You could consider a swing, a sandbox, or even a slide. You might think this is going to distract your children from paying attention to gardening, but it could actually help. Remember that if you insist on your child helping out in the garden, and you impose a strict schedule, he or she isn’t going to enjoy being there which is precisely what you want to avoid. Having a play area near the garden means your children can take a break anytime they want and do something else for a change. Allow them to do as they wish and wait for them to come back to what they were doing voluntarily. Apart from growing colorful flowers, growing vegetables and fruits that you can eat is a great way to ensure a more entertaining and rewarding gardening experience. It’s only natural for children to be more motivated to grow something if they know they can later enjoy the fruits of their labor (literally). Consult with your children on what you should plant in the garden. Make sure you grow something they would enjoy eating. Most children will probably be more excited about growing fruits than vegetables. Even so, try to sneak in some healthy greens in there as well. In terms of fruits, the yield might be even more anticipated if you use them for all sorts of delicious desserts. Speaking of desserts, you can also involve children in making those. For instance, check out how cool-looking and healthy the fruit wands are in the video below are. You can use any fruits you like, so start growing them and make some delicious snacks with your child. 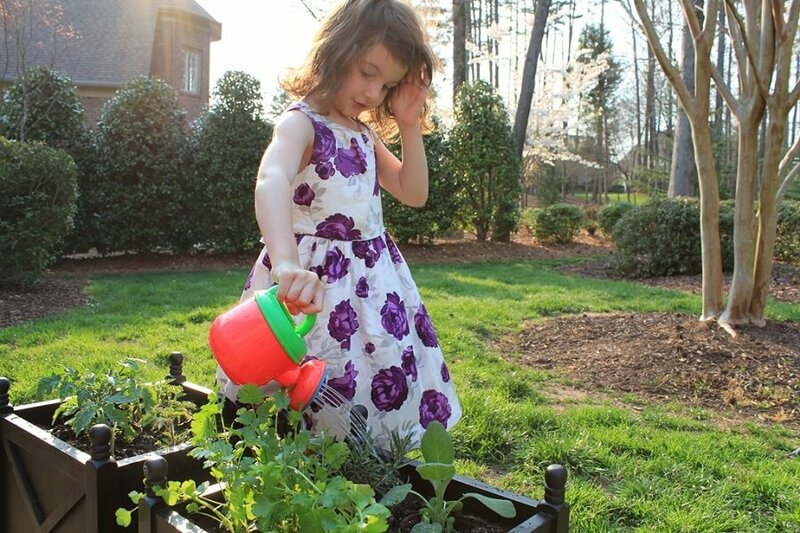 Since you want to get your kids excited about growing plants and also keep gardening interesting for them, you’re not going to want to provide them with difficult tasks. Their first experience should be positive, in order to instill a love of gardening in them. For example, asking them to weed the garden for a couple of hours might take all the fun out of the experience. That’s why we recommend you to get them to help you out with small and relatively easy tasks. One of these tasks could be watering the plants. You can make the process even more interesting by providing them with their own colorful watering can. We recommend the Melissa & Doug Sunny Patch Giddy Buggy Watering Can that has a spout shaped like a flower. Others things they can do to help you tend to the garden would be to place seeds into the ground or keep a tree upright while you plant it. A really fun activity to do with your children that will definitely keep gardening interesting for them is buying some seeds and sowing them in order to form your child’s name. Just make sure the seeds you choose are going to allow the name to be visible once the plants grow. We recommend flower seeds that come with tape, such as these Naughty Marietta Marigold ones that you can find here. They’re easy to sow since all you have to do is arrange the tape to form the letters. Imagine how excited your children will be when they see their name written in the garden with flowers. This prospect might even motivate them to learn how to maintain a flower garden in order to make sure the seeds grow into healthy and beautiful plants. Children need encouragement in order to become more motivated to continue doing something or start a new project. Which is why you have to make sure they know how much you appreciate their work and how well they’re doing. This doesn’t only imply you congratulating them on their gardening skills. It also involves showing off their work whenever you get the chance. For instance, whenever someone drops by, invite them to take a look at your garden and let them know which part of it wouldn’t have been possible without the help of your child. You could also take pictures of their work and send them to close friends or relatives. Especially if the kids have grandparents who live far away, this is a great way to keep them informed on what the children are doing and how much they’ve learned about how to take care of a garden. As we hope we’ve managed to prove in today’s article, it’s not that difficult to keep gardening interesting for children. As long as you use your imagination and follow our advice, your children won’t get bored spending time in the garden. There are many activities you could do with them to keep gardening interesting and entertaining, so make sure you explore as many of them as possible.